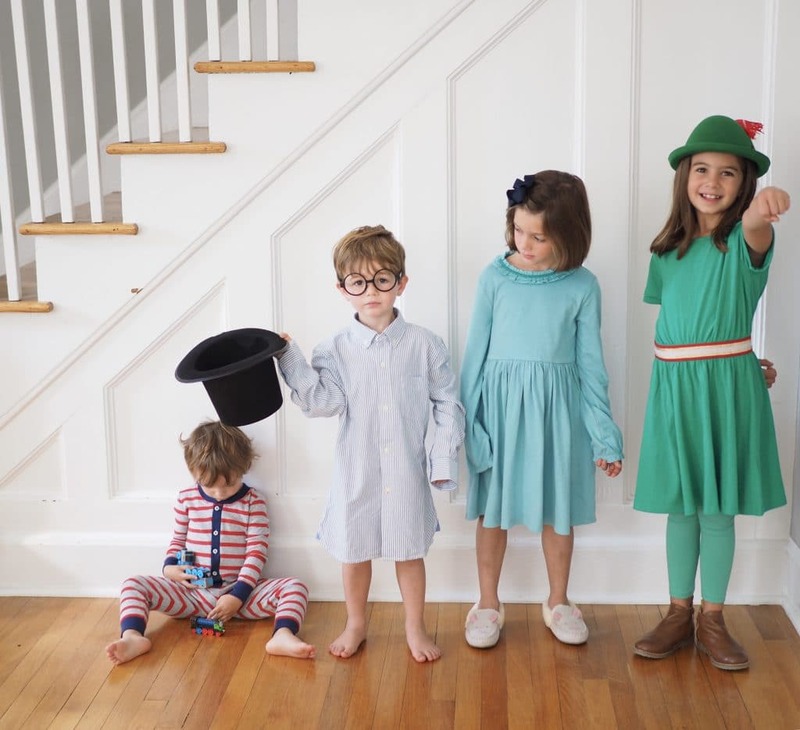 Second star to the right and straight on ’til morning…..
Today we are sharing one of our favorite DIY group costumes yet: Peter Peter Pan, Wendy, Michael and John. 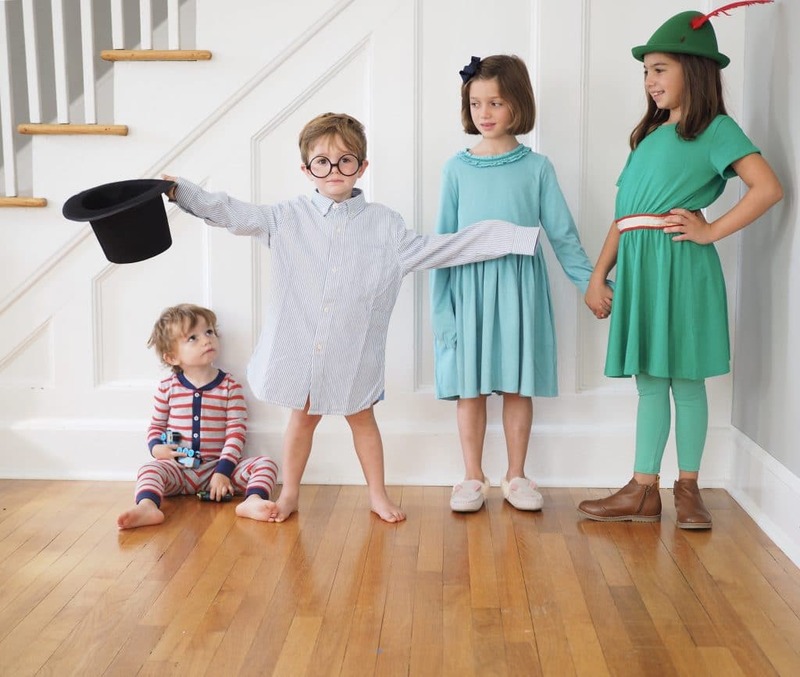 Peter Pan is one of our all time favorite stories, so the kids had a wonderful time helping me make these costumes and then playing Peter Pan in them all afternoon. 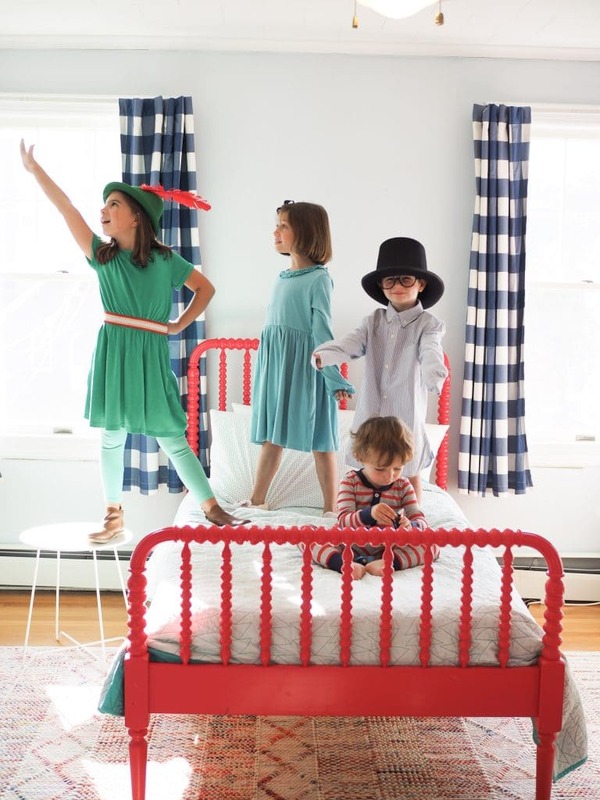 We made this DIY Peter Pan Costume with items from Mini Boden. I like making costumes with items you can reuse. 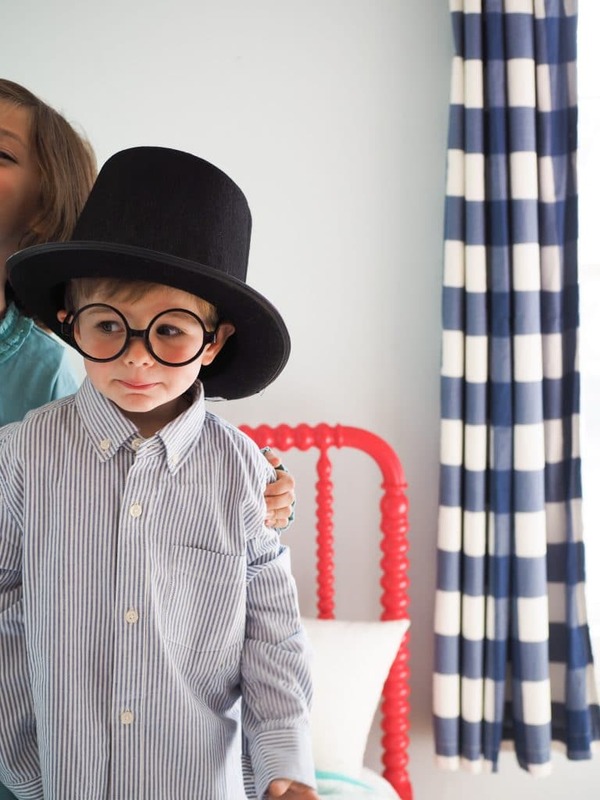 I know my kids will wear these Mini Boden items all year long. Another plus of making costumes from your kids favorite clothes is that instead of being itchy and hard to play in, the costume is comfy, soft and what they are used to playing in. For this we wanted a “night shirt” style pajamas like Michael wears. I went with a stripped button down from Mini Boden in a few sizes too big. It works great for the costume and then it’s a shirt he can grow in to? 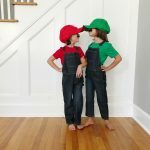 In addition to having great items to make Halloween costumes that you can reuse all season long, Mini Boden has some adorable Halloween themed items. 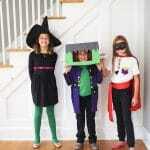 Mini Boden is getting into the spooky Halloween spirit with appliqué witches, glow-in-the-dark spiders, and more! Everything is 100% cotton, so creeping’s never been more comfortable. 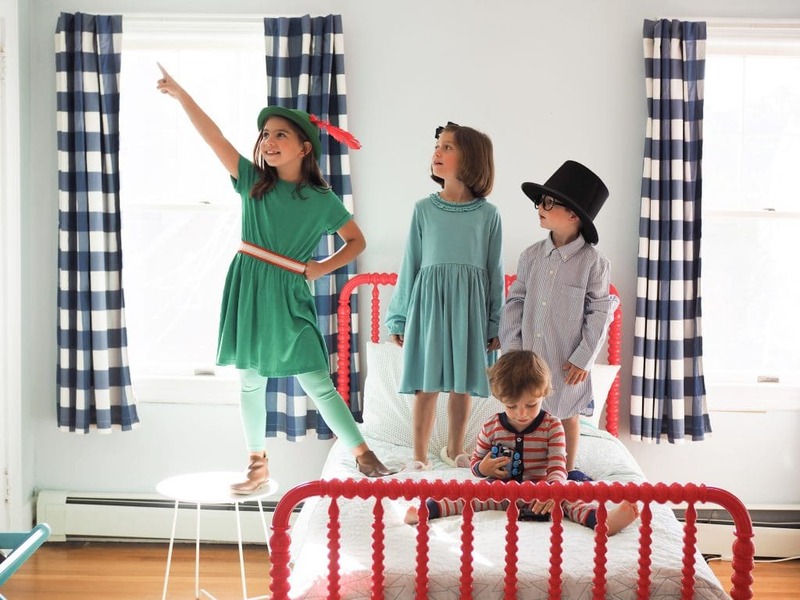 Boden also has their “live now” line encourages children to be whoever they want to be…and what better time than during Halloween? The theme of the line is “if you dream it, you can be it”. Just like in Peter Pan! 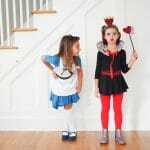 A few of our friends are sharing some frightfully good fun on their blogs along with more Mini Boden Halloween styles! 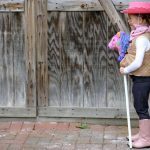 Together we have great DIY Halloween costumes: The Chirping Moms have a DIY Group Peter Pan Costume, Hello Baby Brown has an adorable DIY lumberjack, clown and unicorn and A Little J & K has the coolest DIY wind up doll costume. Looking for fun Halloween crafts and treats? We have those too! The Chirping Moms are sharing 3 easy Halloween paper plate masks, Positively Pearson made Candy Corn Rice Krispie Treats, and Mommamosa made some Rice KREEPY Treats. Trick or treat everyone!